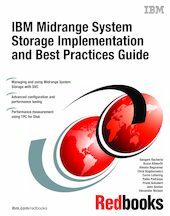 This IBM® Redbooks® publication represents a compilation of best practices for deploying and configuring IBM Midrange System Storage™ servers, which include the DS4000® and the DS5000 family of products. This book is intended for IBM technical professionals, Business Partners, and customers responsible for the planning, deployment, and maintenance of the IBM Midrange System Storage family of products. We realize that setting up DS4000 and DS5000 Storage Servers can be a complex task. There is no single configuration that will be satisfactory for every application or situation. First, we provide a conceptual framework for understanding the hardware in a Storage Area Network. Then we offer our guidelines, hints, and tips for the physical installation, cabling, and zoning, using the Storage Manager setup tasks. After that, we turn our attention to the performance and tuning of various components and features, including numerous guidelines. We look at performance implications for various application products such as DB2®, Oracle, Tivoli® Storage Manager, Microsoft® SQL server, and in particular, Microsoft Exchange with IBM Midrange System Storage servers. Then we review the various tools available to simulate workloads and to measure, collect, and analyze performance data. We also consider the AIX® environment, including High Availability Cluster Multiprocessing (HACMP™) and General Parallel File System (GPFS™). Finally, we provide a quick guide to the storage server installation and configuration using best practices. This edition of the book also includes guidelines for managing and using the DS4000 and DS5000 with the IBM System Storage SAN Volume Controller (SVC).